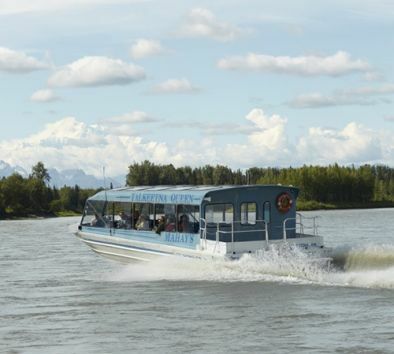 Your journey aboard the fully-enclosed jet boat includes an awe-inspiring 60-mile river adventure that glides along three rivers that offers panoramic views of Denali (formerly Mt. McKinley). As the jet boat cruises through the natural wonderland of spruce, birch and cottonwood trees, be sure to keep your eyes open and camera ready for the occasional birds and animals that call this area home. Alaska is one of four areas in the world that has an extensive braided river system! While on the Chulitna River, enjoy the uniqueness of a braided river that has no definitive delta and changes daily, with gravel bars scattered all about, as well as the beauty of a picturesque rock wall canyon. Next, stop ashore and take a leisurely ¼-mile stroll to an authentic trapper’s cabin and a historically accurate encampment of the region’s original inhabitants, the Dena’ina Indians. Your river adventure concludes on the banks of the Chulitna River just one mile from the lodge. During heavy fog or inclement weather, there will be an alternative drop-off location. Wear comfortable walking shoes. Dress in warm layers. Bring a camera. Wildlife sightings are likely but not guaranteed. Tour will operate rain or shine. Tour operates subject to meeting a minimum number of participants. Tour departs from Talkeetna.